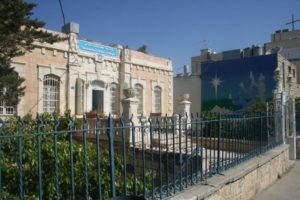 Bethlehem Bible College is committed to growing and strengthening the Christian Church in the Holy Land. The College was founded in 1979 by local Arabs with a desire to offer a high-quality theological education and train Christian leaders for service in the community and local church. The schools mission is to prepare Christian leaders to serve Arab churches and society. They train students to be Christ-centered, demonstrate Godly humility, and biblical wholeness. As life-long learners, Bethlehem Bible College graduates follow the examples of Jesus and show his grace in both their personal and professional lives. In addition to growing young Christian leaders, Bethlehem Bible College recently became a focal point for Christian unity in the Holy Land.